Ankylosing Spondylitis (AS) is a chronic form of arthritis that falls into the category of the spondylarthropathies, or arthritis that affects primarily the spine. In people with AS, the joints and ligaments that allow normal movement of the back become inflamed, producing pain and stiffness, usually beginning in the lower back and often progressing into the upper spine, chest, and neck. 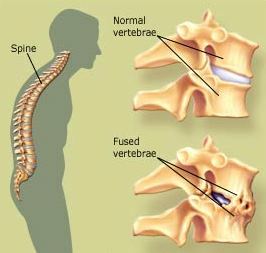 As a result of this inflammation, the vertebrae may fuse, causing the spine to become rigid. Other joints such as the hips, shoulders, knees, or ankles may also be involved. AS typically begins in the low back and progresses up the spine to the neck. Deterioration of bone and cartilage can lead to fibrous tissue formation and eventual fusion or solidification of the spine or peripheral joints. Unfortunately, no treatment stops the progression of the disease. Management of arthritis is aimed toward delaying further deterioration by enforcing good posture, stretching, and, in some people, wearing braces and lightweight support. The pain and stiffness may be relieved by analgesics and non-steroidal anti-inflammatory drugs. Physical therapy also helps considerably to prevent a stooped posture as the spine begins to fuse. Surgery is rarely indicated to correct or stabilize extreme spine deformities due to AS.